While having a roof deck is a great way to increase living/entertaining space, one of the biggest issues that many homeowners experience is frequent leaks. Properly waterproofing a roof deck is often a challenge, because the materials used most frequently, either EPDM rubber, or a Tar/built-up material, do not offer solid protection against leaks. However, there is a much better, longer lasting alternative: a TPO roofing membrane. Its designed with hot air-welded seams, which makes it impervious to water infiltration. While a TPO membrane costs more than rubber, you get the benefit of enjoying a leak-free roof deck for years to come. Also, since roof decks are typically small (under 300 sq. ft.) the real difference in price is miniscule and can be as little as $200-400. Therefore it is always preferable to use TPO (or PVC) membrane instead of rubber. Learn more about TPO membrane costs, as well as pros and costs of installing it on your deck. How Much Does A TPO Roofing Membrane Cost? Being a highly durable and long lasting material, TPO comes with a higher price tag than EPDM rubber or built-up roofing. Expect to spend about $6.50-8.00/sq.ft installed, on a normal roof. 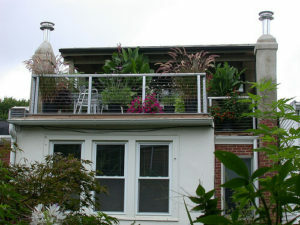 On roof decks you will spend about $9-11/sq. ft. installed. The cost will vary depending on the thickness of the membrane you select (we recommend using an 80 mil membrane, which will cost more), your location and the contractor you hire. As with any material, a TPO membrane has a distinct set of pros & cons, that may not make it the right choice for every home. 1. Hot-welded seam technology makes the membrane impervious to leaks (when done properly). Also makes any repairs very fast and easy. 3. Durability and Longevity: TPO will not fail and start to leak after 6-8 years, which is the expected service life of EPDM and built-up materials waterproofing materials for decks. 4. 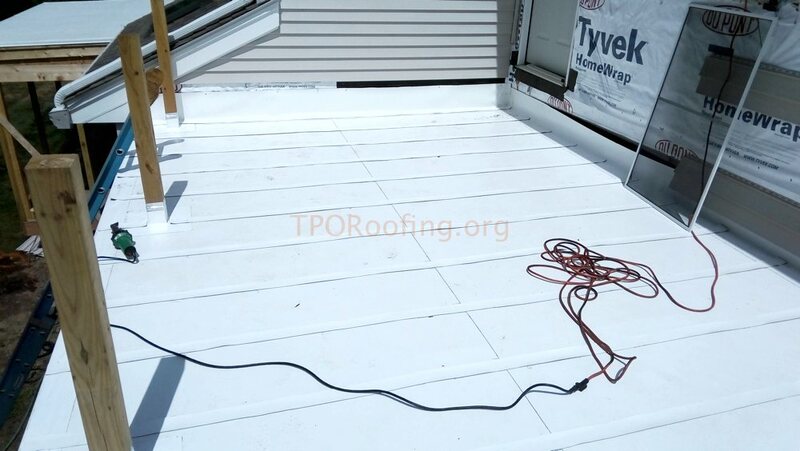 Resistant to Damage: in case the deck will need to be removed in order to make some repairs/changes to the roofing membrane, TPO will not be damaged in this process. 5. Membrane can be installed over plywood or a concrete surface. 1. High Price: TPO costs almost 30% more than EPDM or built-up roofing. This presents a major deterrent to homeowners with tight budget. 1. You should ONLY use an 80 mil membrane, because thinner membranes have a high risk of tearing. 2. It is important to use ONLY high density insulation or DensDeck under the membrane. Don’t use soft foam. 3. 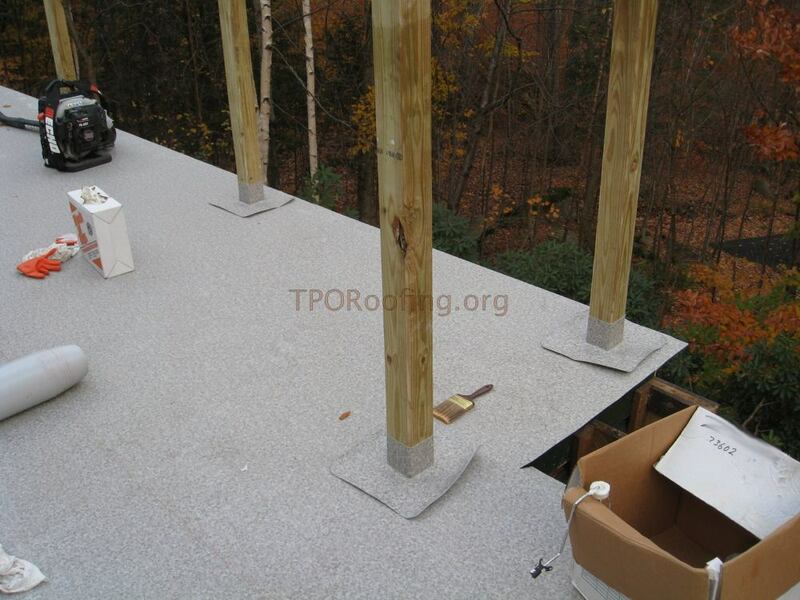 It is best to fully adhere BOTH the insulation and the TPO membrane. However, we’ve installed roof decks, where membrane and insulation was mechanically attached. 4. 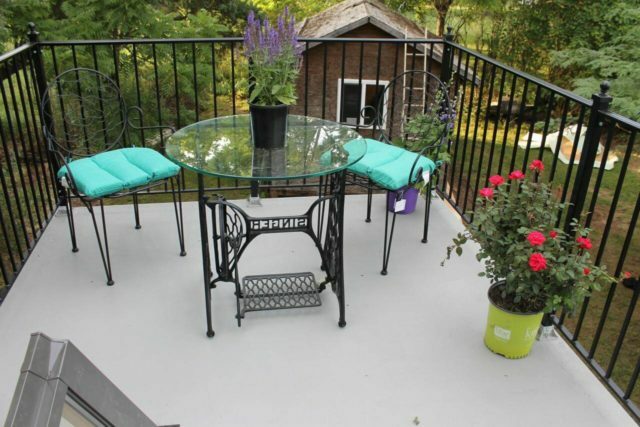 Install all railing posts outside the roof perimeter, to prevent unnecessary penetrations and possible leaks. This is important because railings and walls are a common source of leaks on roof decks. 5. When overlapping seams, we recommend using double welding on all seams to prevent and eliminate all possible roof leaks due to seam failure. Its much easier to spend a little more time to do a good weld, than TO take off the whole deck just to find one leak. 6. Leaks can be avoided by carefully flashing and caulking ALL penetrations. 7. If there is a door that opens out on to the roof deck, it must be flashed properly at the threshold. Avoid using sealants, as these will quickly fail. Sound Waterproofing is the Number 1 Rule of quality roof deck design. Using quality materials, such as a TPO membrane and qualified contractor labor is key to making sure that the job will be done right. 1. Leaks: these usually occur in the waterproofing material, NOT the deck itself. Ponding water, which is often found on roof decks, also has nowhere to go but inside your house. A low quality membrane, such as EPDM rubber will allow water to infiltrate. 2. Structural damage: over years, water slowly enters the homes, rotting the framing, beams and studs. The worst part about this damage that it can go unnoticed for many years, and as a result will be very expensive to fix, once discovered. 3. Interior Damage: If your roof deck leak, you not only need to patch the roof, but also repair inside damages, which can cost $300-1000, depending on leak severity. 4. Mold: It’s not only very expensive to remove, but can cause serious health issues for people in your household, especially to those who already have respiratory conditions. Taking care of these issues, is not only time-consuming and stressful, but also very expensive, and can cost a few thousand dollars in repairs. It makes a lot more sense to spend a little more money on a high quality TPO membrane and a licensed experienced roofer, than fix unexpected problems later on. Can you install tile on tpo waterproofing? Yes, but if that TPO starts to leak, you will have to take all tile off. So before doing tile, make sure that it’s not leaking. 1) Make sure all your welds are 1.75-2″ wide. 2) Probe all seams for voids. 3) Consider doing a seam pool test – cut out a section of seam, and try to tear it apart. Weld a patch over cut section. If this is for bathroom shower, I’d recommend PVC instead of TPO. Can you walk on TPO and put patio furniture on it? I see other websites that say no you cant and that it even voids your warranty. However, you show it in your picture but never really say how durable it is for that kind of use. In the picture above, the material is actually PVC, but TPO can be installed the same way. The only issue you will probably have is that MOST if not all TPO manufacturers do not make those railing post flashings. These post flashings are critical in ensuring your roof won’t leak. I personally think DeckShield is better, but merely because that’s the one I installed many times. I never worked with DecTec, so don’t really know if it’s good or bad. Building a new deck over a living space. Want to know more about this product and what slope, substrate, etc. is recommended. Recommended substrate is DensDeck or similar. 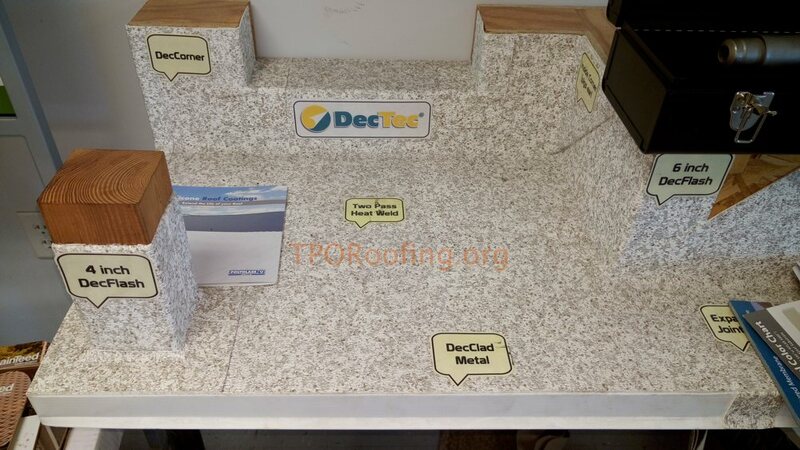 Products are many, but in the end, if you want TPO on a deck, you will need floating wood deck on top, or see my earlier comment about other roof deck product options, such as DeckShield and DecTec. So, today is Feb 20, 2019. I’m thinking about pvc tpo for a rooftop deck. can I fiberglass the T&G decking, then put the pvc tpo, then porcelain tile over that?